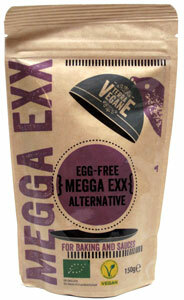 An amazing product from Germany, Mega Exx will become a staple in your kitchen for replacing eggs for your baking needs. Whether you're baking, making sauces, or needing something to replace egg whites as a binding agent in your favorite recipes, Mega Exx has you covered. Each handy 150g (5.35 oz.) resealable package has the equivalent of 20 eggs inside, letting you bake to your heart's content so that you can create all your favorite dishes without sacrificing texture or quality. Made with simple organic ingredients, just mix 7g (about 1/2 tbsp.) with 30ml water, and you'll have the equivalent of one egg ready for whatever it is you're about to whip up. It's also gluten-free and soy-free, too! 150g (5.35 oz.) packet is $5.99.